This 15 day tour is continually being tweaked and the details and pricing are being finalized for September 2015. I am looking toward having this trip start the day after Labor Day, 2015, so as to give an extra travel day. Fifteen days is two calendar weeks. This is going to be an amazingly awesome tour of South India! TWO OR MORE STUDENTS WILL RECEIVE 5% OFF THE TOUR PRICE! Because hotel prices are less expensive in September, the anticipated cost of this tour will be less than I originally anticipated. Right now I am estimating the trip to be about $2,600, with a single supplement making it $600 more. Bring your students and receive 5% discount — that can pay for your travel insurance! You will be offering your yoga community an amazing opportunity to see the Heart of India with you AND a seasoned 8 time traveler to India. We will practice yoga and meditation in the mornings where possible. I shot the photo below on my first trip in 2005. 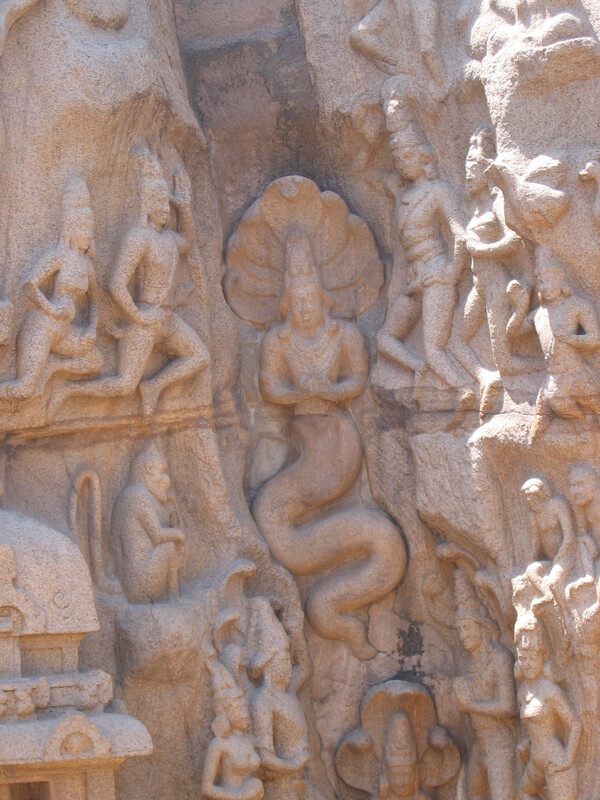 Mamallapuram is a UNESCO World Heritage site where you will explore the mythologies of India. Mahabs (as I call it) was a thriving port about 1,400 years ago where hundreds of craftsmen worked to create some of the greatest shrines and sculptures of India. You can visit the shops of the modern stonecutters and buy your own statue of Patanjali. This will be a trip of a lifetime. Next Post Temple Tour of South India/Tamil Nadu Yatra — it’s a GO!